Over the past few months there has been plenty of speculation around the Web that Twitter’s growth has stalled, but if we look at activity on Twitter in terms of the number of tweets, this is far from the truth. 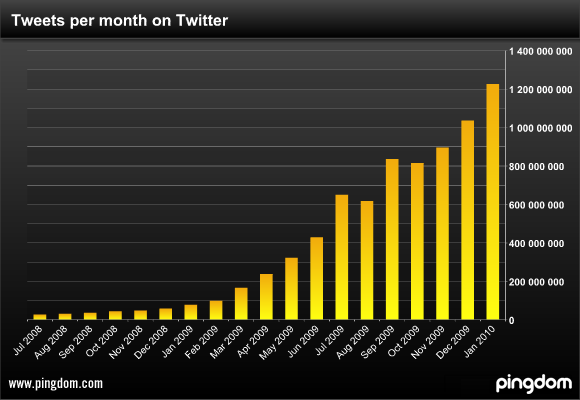 To visualize the increase in Twitter activity over time, we have created a chart that shows the number of tweets per month back to mid 2008. It’s quite revealing. Viewing this, it becomes very clear that not only was 2009 the year that Twitter’s popularity really exploded, it also shows that Twitter usage is still increasing rapidly. The really good part about this chart is that it represents all tweets, including those made from third-party applications via Twitter’s API. This means that we see the actual activity of the Twitter service as a whole. The last three months have all seen a month-to-month growth in Twitter activity of close to 17% (Nov: 16.8%, Dec: 16.6%, Jan: 16.9%). If that growth rate stays more or less the same for another month, Twitter should process around 1.4 billion tweets this February. Perhaps a bit less considering February is the shortest month of the year. Note that this research is about Twitter usage, not the number of users, which we have no definite data for. However, it makes sense that with increased activity, the number of users should be increasing as well. Methodology: To be able to calculate the number of tweets per month, we tracked down a tweet from the first couple of minutes of each month. Using the sequence numbers of these tweets, we could then calculate the number of tweets for each month. Since finding old tweets is more or less impossible with Twitter’s own search engine, we used Google, then verified the tweet time stamp by looking at the tweet itself. Further reading: Our November 2009 study of when and how often people tweet. Very good post! It will put an end to speculation that twitter is or will no longer be a viable site for businesses to build communities and help to manage their brand! Thanks for posting and sharing with us.. The big question is…how many of these billions of tweets are really useful… a one or two zero figure? @Johannes, i wonder it too. Lots of tweets but how many of these billions of tweets are really useful. I think most of tweets look like garbage at twetter. Most of the twitter’s are garbage or spam. “I have 4000 followers” – It is one of the hypes so called “naive” IM gurus use as a tool to promote themselves. I prefer identi.ca – much better and professional. very huge figures. how i can get the tweets data for my research purposes? wow a billion is a lot. I think twitter is a lot like a face to face conversation, including interruptions, and that’s why it is so popular. The big question REMAINS: how many of these billions of tweets is really useful? I really think it can’t be more than a few dozen. Do you analyse figures for that as well without deleting difficult questions?